In this unit, students will be exploring different methods of modeling animal classification using the arts. They will incorporate methods of visual arts, playwriting, and performing. There will be multiple opportunities for students to engage creatively and collaborate with peers. How can analyzing animal attributes in the animal classification system help us to understand their role in the ecosystem? Scientists study and classify animals to gain a better understanding of their needs. Humans are classified as animals, and all animals are interdependent. Scientists need to understand animals to deal with issues such as endangered species, sickness, etc. Classification is important in general because it helps us to organize the world around us and draw meaningful conclusions about groups of things. 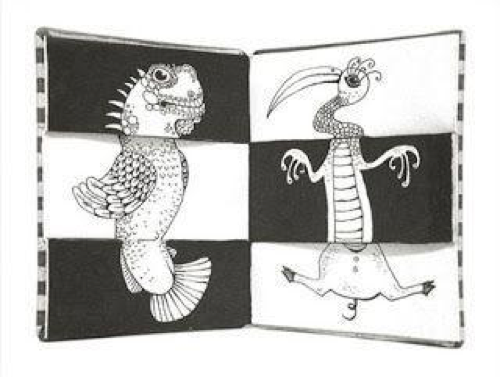 In this project, students will explore animal attributes by becoming inventive and creating a one-of-a-kind critter using the art technique of “exquisite corpse”. The synthesis of knowledge of animal classification in this visual way is both engaging and memorable. Students will write a description of their critter detailing the characteristics of each animal group they integrated into their design. Students will name their animal and present their animal to the class via a “Wanted” poster. In this project, students will write a fictional play around the premise of a zookeeper trying to solve the problem of “the zoo just received several new animals and no one knows where each animal belongs”. The play will incorporate science content that will demonstrate student knowledge of animal classification. Students will also create 3-D masks to represent the animals in their play. To culminate this project, students will dramatize their play to an audience in order to express the inner workings of the animal classification system. How can I apply my knowledge of animal classification to create a new critter using the “exquisite corpse” technique? How can I develop a play that illustrates how animals are sorted into groups? How can I create a visual artwork that clearly articulates the characteristics of vertebrates? How can dramatizing a play help me to communicate and model scientific concepts? Develop a model that illustrates how animals are sorted into groups (vertebrate and invertebrate) and how vertebrates are sorted into groups (fish, amphibian, reptile, bird, and mammal) using data from multiple sources. ELAGSE5SL1: Engage effectively in a range of collaborative discussions (one-on-one, in groups, and teacher-led) with diverse partners on grade 5 topics and texts, building on others’ ideas and expressing their own clearly. VA5MC.1 Engages in the creative process to generate and visualize ideas. VA5PR.2 Understands and applies media, techniques, and processes of two-dimensional art processes (drawing, painting, printmaking, mixed-media) using tools and materials in a safe and appropriate manner to develop skills. VA5PR.3 Understands and applies media, techniques, and processes of three-dimensional works of art (e.g., ceramics, sculpture, crafts, mixed- media) using tools and materials in a safe and appropriate manner to develop skills. After completion of the “Playing with Animals” activity, the class can share the play with a first grade class and complete the reflection activity. Students could use ChatterKids to make their critters come to life and share their descriptions and characteristics that they wrote. Students will fold paper so that there are three vertical sections. After the first roll, student will draw the head of an example of that sub group. (e.g, if the teacher names mammal, the student could draw the head of a dog) on the top section. After a specified amount of time, the student will fold the paper so that only the middle section is showing and pass to the next student. The students will again roll the die, and draw the torso of an animal that represents that sub group. After a specified amount of time, the student will fold the paper so that only the bottom section is showing and pass to the next student. The students will again roll the die and draw the bottom (feet, tail) of an animal that represents that sub group. The last student in the group will open the paper to reveal the three sections. The student will take the created critter and develop a name for the critter using all three of the animals in the picture. The student can now outline with Sharpies if desired, add color and an environmental background for the critter. The teacher might want to have the student monitor each other so that they do not draw the same animal on the paper, even if they draw the same group. Encourage students to consider placement and size of each body part; center each part; draw large enough to show texture and details, etc. The teacher should emphasize that while the drawing does not have to be realistic, it should include enough detail to show characteristics of the vertebrate group. From using the exquisite corpse technique, what did we learn about animal classification? How realistic was this; does this sort of cross-breeding happen in real ecosystems? Can we brainstorm some examples of this? What sort of adaptations could we envision these critters having? How would these help them survive in their ecosystem? ELP Level 1-2: Label critter’s characteristics directly on the poster using a word bank provided by the teacher. Picture and first language support should be used as needed for unknown vocabulary. ELP Level 5-6: Write a longer description including how their critter’s characteristics contribute to their ideal habitat. Ashley Brian is an author and illustrator who uses a lot of animals in his work. His stories may be good spring boards for student work. Henri Rousseau: French post-impressionist painter in the Primitive manner. His subject matter was often ecosystems. The following technology integrations are meant to either replace the live play performance or to be used as an extension to the project. These are both green screen video presentation options. Teacher will lead students in a “Story Chain” activity with pantomime when applicable. Another student will add the next ONE sentence detail to the story, making sure to remain in 3rd person, as well as relate to the details mentioned before. For example, “Pat walks into a forest. Pat hears birds chirping.” This is not a good example, “Pat walks into a forest. Pat sees a dolphin jumping out of the ocean.” This is not a good example because you would not see a dolphin in the middle of a forest. As a student shares their one sentence detail, they will pantomime the verb(s) within the sentence. The activity continues with each student in the group adding a new detail to the story, making sure to remain in 3rd person, as well as relate to the details previously mentioned. The goal of this activity is to get students listening to each other (they will have to do this when they collaboratively write their play), making ideas connect (their individual animal descriptions/details must connect within their play), and moving in ways related to what they are saying (in the play they will have to perform in the role they have chosen). Disclaimer: Students can take the story in any direction they like; however, they just need to make sure the details lead them there. For instance, “Pat walks into a forest. Pat hears birds chirping. Now Pat is walking on the planet Pluto.” It is okay for Pat to end up on Pluto, the students just need to provide the details of how Pat gets there. If not done already from the activating activity, the teacher will place students into groups of 6-7 (group of 7 will have an added animal group of invertebrate). Students will pick roles: zoo keeper (narrator), mammal, bird, reptile, amphibian, fish (optional invertebrate). As a group, students will decide the order the characters will appear and compose the final script. Teacher will formatively assess students during the writing process using the attached “Teacher Checklist” to ensure students remain on task. At the completion of the play writing, the teacher will use “Task A” rubric to summatively assess the written portion of the play. *Explore option of collaborating with art teacher to support time constraints; i.e., the art teacher has students create the plaster mask base in art class. Students will design a mask of their selected animal using the PDF paper template attached. Students will plan the color, shape, texture, and armature(s) (extensions) of the mask. At this point, hopefully the teacher is able to get students to construct the plaster mask within art class. If not, the teacher will need to instruct students on the plaster mask process. Give each student a plastic mask template. Cut the Rigid Wrap into strips (approx.. 2” wide, length is dependent on style of mask); smaller pieces for certain areas. Once the form has been built, students may begin the plaster process. Dip the Rigid Wrap strip into warm water until it begins to soften and then place on the mask form. Continue to layer the strips and overlap until the mask form has been covered. After the plaster masks are dry, students will use paint, glue, and texture materials to decorate mask. Students will include appropriate media for their selected animal (faux fur for mammal, mesh netting for reptile or fish, feathers for bird, metallic paper or paint for amphibian). Teacher will formatively assess during the process of Day 2 and 3 using the “Teacher Checklist” attached and will also summatively assess using the “Task B” rubric attached. On day 4, each group will need to rehearse its play, focusing on individual volume, tone, and character concentration. Groups will also need to focus on the ensemble and stage blocking of each character to ensure group collaboration. Each group will dramatize the play for an audience. Teacher will summatively assess using the attached “Task C” rubric. On the plaster mask creating day, prepare the classroom for easy clean up by covering tables and desks with butcher paper or newspaper. Have towels available for spills and for students to wipe hands at the conclusion of activity. On the play dramatization day, create a “stage” area at the front of the classroom to provide students a designated area to perform. It is suggested to also create an area for the audience. How did the dramatization help you model the classification of animals? How did creating the animal mask help you understand the characteristics/attributes of your animal group? How did writing your character’s role in the group’s play help you communicate the characteristics/attributes of your animal group? Is there anything about your group’s project you would like to change in order to make better? Name 1 “glow” and 1 “grow” for your personal contribution to your group’s performance. Below Grade Level: Provide students with an example of an animal with the characteristics of both invertebrates and vertebrates. Direct students to act out each animal sound. Limit the audience size for students reluctant to perform for a large group. Above Grade Level: Provide students with the opportunity to include animal adaptation in the storyline of their script. Also let them consider writing an epilogue to their play. This would include writing about what happens to the characters “after” the story is resolved. Classes could pair with 1st grade classes to perform plays. At the conclusion of performances, 5th grade students can pair with 1st grade students to complete reflection questions. For an extension of this particular project, technology can be incorporated in many ways. One way that technology can be incorporated is by using the apps of Dolnk, or Touchcast. These apps are green screen apps that the students can use to create and produce backgrounds if they chose not to perform the play production in a live setting. The students will record using an iPad or mobile device and the production can then be played back for other students at a later time. The teacher will play a song about animal classification found on YouTube. Students will use theater, music, movement and the visual arts to explore plant and animal cells. The unit’s projects will lead students to making discoveries about the different cells they examine and the inner relationships of the organelles. Students will also strengthen their informational and opinion writing skills through the projects in this Cells Celebrate! How can analyzing the relationships of cell organelles help us to understand living things? We study and analyze cells because they are the basis for life. We are all made up of cells and it is important that we understand the function of all of the organelles present in cells so we know how cells work. Scientists and doctors study cells to understand things like cancer and diseases. They work to detect when a cell looks abnormal and what may have caused it to be abnormal. Understanding the foundational knowledge of a cell leads us to understanding the inner workings of biology. Project 1: Do You See What I See? The purpose of this project is to introduce students to the tools used to observe cells. Students will investigate the appearance of various cells using a microscope. Students will explore how the parts of a small organism work together and compose the parts of a whole. This lesson suggests also collaborating with the art teacher to take a closer look at students’ microscope sketchings and creating a large work of art that amplifies the organelles that make up a cell. This lesson introduces the various organelles in a plant cell (chloroplast, cytoplasm, cell wall, cell membrane, nucleus). Students create riddles for the various organelles. Students then explore applying rhythms and movements to the organelles that support the function. Students will integrate their knowledge of previously taught organelles in a plant cell with theater arts. Students will use the different organelles: chloroplast, cell wall, cell membrane, cytoplasm, and nucleus to construct tableaux of plant cells. They will then dramatize the organelles by understanding their function in the cell and their relationship with the other organelles. This project integrates music and visual arts into students’ study of both plant and animal cells. In this project, students will compare and contrast the organelles in both an animal cell and plant cell. Students will create a rap that shows their understanding of how the individual organelles function in both types of cell. Students will integrate theater and explore the roles of the organelles in both plant and animal cells. This project will require students to role-play in the various organelle roles and then write an informational opinion piece about why their organelle is the most crucial cell part. Students will rehearse and perform in a cell organelle debate where they will defend their arguments. Students will work as a team to debate a common goal together. Students will create a three-dimensional sculpture of an animal or plant cell. They will use various objects and mixed media to work as a group and construct a model. Students will then explore what they notice when they examine a cell from a 3D lens. VA5PR.4 Plans and participates in appropriate exhibitions of artworks. In this unit there are many opportunities for the class to share an arts integrated project for another 5th grade class audience, particularly the 3D Cell Models and the Cell Debate projects. The 3D Cell Models could be set out with the students serving as tour guides. Another class could visit each exhibit and ask questions to the “cell experts.” The Cell Debate could easily be a performance where another class could video record and analyze the presentation. Character Education is truly integrated when opportunities are created for students to teach other students. Also character education opportunities are created when students step into the role not only as performers but also as audience/ critics who analyze closely what they see to provide peer feedback. Students are directed to select one of the one of the images they saw with the microscope and create a field of view drawing representing what they observed after viewing various cells. How does the concept “Parts of a Whole” relate to understanding organisms? What does it mean to magnify? What do we see when we take a closer look? Field of View Handout (see Downloads) Students are to select one of the images they saw with the microscope and create a field of view drawing representing what they observed after viewing various cells. What media is used in the painting? How is the artist able to create perspective? What does the artist emphasize? What kind of balance is apparent in the painting (symmetrical, asymmetrical, radial)? Class will discuss the visual aspects of cell organelles, such as cell wall, cell membrane, nucleus, chloroplasts, shape, and relative size. Teacher will model how to use the microscope with various slides. The teacher will review the parts of a microscope and proper ways to use it, by showing how to adjust focus, place slides on the stage, and adjust slides. Students rotate through 5 centers viewing slides of various cells or organism parts. Students will make a rough draft of the image seen including size, organelles, and hypothesize what type of cell they see in each. Students will then choose one of the cells they viewed and create a detailed drawing of what they saw in their microscope field of view. Teacher will collaborate with the visual arts teacher to direct students to use their cell drawings in groups to collaboratively create a large painting representation of the cell and all of its parts. Students will partner up with one another to reflect on what they saw. Students will swap drawings with their partner and hypothesize what the image represents. They will then take turns explaining to their partner what their drawing represents. Teacher will allow students reflection time using the following prompts that students can either discuss or provide feedback using the Written Reflection Form (see Downloads). When you drew your sketch, how did the microscope help you? Why is perspective important when turning your cell into a piece of art? How is the artistic process of creating a piece of art similar to the scientific process of examining a specimen? Tell me about your cell organelles. How did you know this was the cell wall? Cell membrane? Nucleus? Chloroplasts? What do you notice about the shapes of these organelles? Do you notice any similarities between the job of a scientist and the job of a visual artist? Students will view prepared slides online to accommodate individual differences as needed. Students will be in heterogeneous groups so peer tutoring will be available for students who need further assistance. Also, teacher will be available to assist students as needed. Students create detailed drawings of two different specimens and compare and contrast the two specimens. Students will write about their observations. Throughout this lesson, pair EL students with high achieving students. They will work together instead of individually. The pair will continually converse with one another. This allows for reinforcement of the science vocabulary terms, as well as extended discussions to take place. Furthermore this partnership will assist in a deeper understanding of the concepts being taught. Students will rotate through 5 stations set up with microscopes or slide viewers to observe prepared slides of various cells. Students will choose one of the cells they viewed to illustrate on their “microscope field of view” sheets. What are the functions of the various plant cell organelles? How can I use movement and music to help me learn the different functions of each plant organelle? Cell Function Riddle: Students create and display their own riddle to be shared with the class. Teacher will ask students to talk in small groups about what they think each part’s function is based on the labeled cell diagram. Teacher will keep student-led list for each cell organelle. Review the quarter note, eighth note, and half note. Demonstrate how quarter notes can be tapped or clapped to the syllables in each word. Go through all of the organelles and apply rhythms to them. After the 5 plant cell organelles are taught, the teacher will lead the students in developing motions for each of the cell organelles. (Example: NUCLEUS = 3 quarter note pats (syllables) on the top of the head.) The dance movements should reflect the function of the cell to help with associating the function with the movement. For instance, the “Nucleus” is the boss of the cell. Encourage students to create a movement that they may see a boss character do. After the students have developed a class list of motions, students will get into small groups and be given an organelle. Each small group is asked to create a riddle for the organelle assigned. Lead the class in reviewing the choreography and rhythm assigned to each organelle. Each small group is asked to go to the front of the class and read their riddle. The class will then try to guess the organelle by using the motion assigned for that specific organelle. Students will use a piece of colored construction paper to write their riddles on. Create an interactive display where the students can go to read the riddles and then flip display to view the riddle’s answer and the organelle. What were the artistic choices I made? Why did I pick the specific movement and rhythm for my organelle? Why is it important to know the function of each plant cell organelle? Students may be provided with a list of the names of individual organelles and randomized list of functions for visual matching ability. Individual subgroups of students can create different motions for the various functions of the organelles, instead of sharing in a classroom set of dance motions and musical beats. Students write their own riddles for the specific functions of all of the organelles instead of just the one assigned to their group. Consider going over the science vocabulary words ahead of time using colorful diagrams and small group discussions. Do this ahead of time so students grow more familiar with the words. How can I use tableaux to analyze the functions of the organelles in a plant cell? Teacher can monitor students through anecdotal notes for understanding of tableau elements, plant cell organelle concept understanding, and teamwork. Why did you choose that body level for your organelle? Why did you choose that facial expression? What is the relationship that your organelle had with the other organelles? *Introduce the “principles of tableau” and discuss how creating a strong tableau requires a clear body level (low, mid, high) and big facial expressions. *Draw attention to how creating a strong tableau requires establishing clear relationships and making sure the audience can see our faces. Teacher will describe to students that in today’s lesson, they will create a tableau. Teacher will then hand out individual index cards with the plant cell organelle names listed to students. (Teacher might differentiate lower level cards—easier organelles/functions—to lower level students). Teacher will list each specific organelle on the board for students to make sure that it is in the tableau that they are going to create. Teacher will quickly review the functions of each organelle. Teacher will then walk around the classroom and tap individual students on the shoulder. The student that is tapped must then be able to reply with a 1 sentence statement regarding the function of their organelle. After the tableau, students will then be directed in writing an informational narrative from the point of view of their cell organelle. The student must take what they know as the function of that organelle and produce an informational monologue, which will eventually be presented to the class. Students must write from the viewpoint of that character and be sure to include all applicable content area vocabulary relevant to their organelle. Students will be graded using the Informational Writing Rubric (see Downloads). Students will then share their cell organelle monologue with the class. Other classroom students may provide constructive feedback on theatrical delivery (diction, facial expression, tone, volume, pitch, etc.) using theater arts vocabulary. How did using tableau help me understand the plant cell and the roles of the organelles? Group students for tableaux in heterogeneous groups, combining below level/EL/above grade level students together for better explanation/mastery of content. Create a whole-class tableau to model the various elements of a tableau before having the students break into small groups and performing their own individual tableau. Have the students create a sketch of their tableau to show the relationship and connection/location between each cell organelle and explain its specific function. On the sketch, students must label the organelles and describe the function of each organelle in 4 words or less (for each organelle). This project integrates music and visual arts into students’ study of both plant and animal cells. In this project students will compare and contrast the organelles in both an animal cell and plant cell. Students will create a rap that shows their understanding of how the individual organelles function in both types of cell. What are the functions of the various animal and plant cell organelles? How can music be used to create connections between the two types of cells? Teacher will lead students in a 4 corner review game to review the organelles of a cell. Teacher will then call out the function of the various organelles and the students must move to the appropriate corner of the room to match the function and organelle. Assign half of the groups to create a 10-line rap about the function of each organelle (cytoplasm, nucleus, and cell membrane) in an animal cell. Assign the other half of the groups to create a rap for a plant cell. Option: Allow students time to work with the various apps listed above and try recording a version of their rap with background beats incorporated. Small groups share their Cell Raps. Together as a class, begin a 5-line rap together that compares and contrasts the 2 types of cells. Students get back in groups and independently finish the last 5 lines of the compare/contrast rap. Groups share their different endings. Students work collaboratively in groups to create Word Art for all of the organelles in the cell they were exploring. The students must use the properties of each organelle and the function to best illustrate the vocabulary word. (Example: Cytoplasm might be “oozing” and use thick shaped letters and have pieces inside—representative of it’s function and physical properties). How would I rate myself on the understanding of the differences between plant and animal cells and their organelles? How does music and writing a song help me understand the concept of the differences between plant and animal cells? These groups of students can work with the entire class to create the 10-line rap song, and focus more on their performance and mastery of the content. Consider splitting the class into 2 groups and having a Rap Battle. These groups of students can create the entire rap by themselves, instead of working with the entire class. Instead of working in homogeneous groups to create the last 5 lines of the rap, the teacher would pair an EL student with a higher fluency/language student to work together in a one-on-one collaborative pair. How can we use drama to compare and contrast animal and plant cell organelles? How can we use informational and opinion writing to express our scientific discoveries? What are the functions of the various plant and animal cell organelles? Students will work collaboratively in groups to determine debate points about why their organelle is best. Create different monologues for organelles in both plant and animal cells. Cell Debate Video Self-Assessment (see Downloads): Students will rate themselves on their recorded video debate after it is watched after the debate. Have the song Cells by Mr. Parr playing when walking into the room. Ask students to listen for familiar vocabulary words, and have students write down familiar vocabulary terms. As a class, discuss the vocabulary identified and reinforce the meaning of the words. Place students in small groups and give them each an index card in their group. Each group should have an individual index card for each of the plant cell’s organelles. Tell students that today they will be role-playing and stepping into the role of the particular organelle listed on their card. Direct students to write down 3 character traits for their organelle on the backside of the index card. Students introduce themselves and their traits to their peers in their small group applying vocal choices to their characters. Model for students how to use pitch and tempo to change your regular speaking voice. Try saying “Good Morning Class” using a gruff, low voice. Try saying “Good Morning Class” using a high, timid, squeaky voice. Try saying “Good Morning Class” using a smooth, sing-songy voice. Direct students to think about their own organelle character voice and make a vocal choice. The students will then be given a set amount of time to independently work on writing an informational monologue from the viewpoint of that specific organelle as to why they are the most important part of the cell. *An example of a Persuasive Monologue can be found in Downloads. After students have completed their writing, the students will return into their small groups they were placed in during Part 1. Students will come up with discussion points about why their cell part is the most important. As a class, develop a list of questions that students could ask characters during the debate. Direct the questions to stay open-ended enough to really allow students to improvise and express their responses with evidence from their notes. Set up the room for a panel of guests to sit in front of the room in a line of chairs. This group should be one of the small groups that includes all of the different organelles in a cell. Ask that the remaining students step in-role as reporters to ask questions during the debate. The members of the group that was selected to participate in the debate perform their responses to each question in character as their organelles. During the debate, the teacher will use the Assessment (see Downloads) to assess students during the activity. On various days, you can allow for different groups to participate as guests in the debate, sitting in the front of the room. The teacher should be in role as the “moderator” to help facilitate the discussion and the time given to each character to respond to the given question. What acting choices did you make for your organelle? Why? What was the most persuasive point you made during the debate? What would happen if your organelle was not present in the cell? Next time you prepare for a debate, what things do you think are most important for you to think about? Encourage these students to research further in order to add to the debate question: Why is their organelle the most powerful/important in regards to the respiration/photosynthesis cycle that happens in plants? They could also teach and explain their theory to other students. What is the relationship between each organelle? How do the 3-D sculptures of the animal cells compare and contrast to the 3-D sculptures of the plant cells? What new discoveries have you made about the composition of a cell when constructing a three-dimensional sculpture? Students begin the artistic process of creating their sculpture/3-D model by first sketching and labeling their plant cell on drawing paper. Students are placed in groups, and students share their sketches with their group members. Students discuss the sketches and together collaborate and create a plan for their group’s sculpture/3-D model. The students will work in groups using the materials provided to create their model of a cell and label the organelle’s parts. Students will use the Self-Assessment Checklist (see Downloads) individually. Students will take a picture of their cell using a class camera or iPad to upload to the class website and email to teacher. Students will be required to reflect on their own process of learning and justifying decisions for both science content/artistic decisions. Teacher will group students accordingly and will also assist groups as needed to ensure models are correct. Students will have to make a 3-D model for both the plant and animal cell and label them. "Arts Edge: “What’s Inside a Cell?"